Home > Politics > Policy & Ideas > Do We Know it’s Christmas? So writes Mary Dejevsky in this weeks Independent (see here ‘Breaking up should not be so hard to do’). Well, no Mary we do know it’s Christmas – as apparently does Africa (‘Yes we know it’s Christmas’ say African musicians). It’s a good piece from a woman with a vast international experience that – importantly – points out the benefits for renewal that independence would create for England too. In other news, if you have one New Years Resolution this year its should be to cancel that Daily Mail subscription. Writing on Gus O Donell’s comments Nick Wood says: “The scheming SNP leader Alex Salmond is persistently fanning the embers of Scottish grievance, never a particularly difficult task, in the hope that he can spring on them a referendum on quitting the UK and signing up to the European Union as tartan version of some inconsequential place like Latvia. The Scots, notoriously canny when it comes to money, are reluctant to turn their backs on the bank of Mum and Dad. They know that with the rest of the UK forking out £11 billion a year in subsidies, they have got a great deal from the English taxpayer. No tuition fees, free personal care for the elderly and free prescriptions are just some of the wondrous perks of living north of the border (read more of this here). So now we’ve established that we KNOW about Christmas and we can live high on the hog this Xmas thanks to the benevolence of our Southren neighbours, it’s time to switch off this machine until early in the New Year when we’ll be back, if not refreshed then at least revived by digital detox. 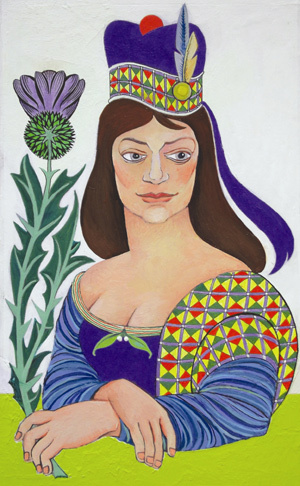 Before we go and crack open the sherry, we are delighted to issue to all of Scotland our Christmas card via our Christmas helper, Alex who said he was delighted with the Bella Caledonia card which “personifies Scotland as a strong woman with a passion for social justice”. Thanks to all our readers and writers, have a great Christmas & Hogmanay! I’ll pass on your generous offer to read a daily screech attack on Scotland. There hasn’t been anything that has come out of that particular mouth that hasn’t first come out of a nags arse first. Daily Mail accusing others of ‘fanning grievances’? Pot. Kettle. Very fckn black. The subsidy go’s one way babe scottish oil revenue etc to england. The so-called perks. Are payed for by our selfs. And as we such a generous people in scotland. We leave a cash subsidy for our good friends in england. You cant get a better neighbour than that. Or maybe mug. So Scotland has New Year and England has Christmas thus proves other differences to support an anti English agenda. As for “personifies Scotland as a strong woman with a passion for social justice”. Looks more like a bloke in drag to most. I cant vouch for your lack of aestheic judgement but the article was posted by an Englishman – Paul Kingsnorth and is by the Independent’s chief edirtorial writer, Mary Jejevsky, one of the country’s most respected commentators on Russia, the EU and the US, Mary Dejevsky has worked as a foreign correspondent all over the world, including Washington, Paris and Moscow. Maybe you should read articles before commenting on them, it would hugely increase your understanding of them? Females always an easier target. If you want to bash a unionist mainstream journalist, why not pick on a male. After all, they are the majority. @KennyFarq, the man who doesn’t want unemployed, OAPs, ‘hard left’ and ‘loons’ to have a voice in Scotland, for instance.